You are here: Home / Civic Engagement / Are you registered to vote? There are several projects that we launched in 2013 that I’m particularly proud of – one that comes to mind today is votePGH. This was a little project that we put together, with the help of some other generous volunteers who created the logo and designed the website in just a few days. 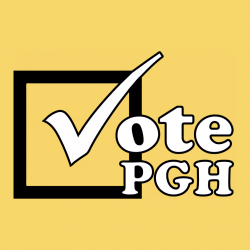 The goal of votePGH is to generate awareness about upcoming elections and to make sure Pittsburghers are registered to vote. Yesterday, I attended the inauguration of Bill Peduto as the 60th mayor of Pittsburgh. I usually don’t write much about politics here on IheartPGH, but this blog was created from many conversations that I had with Natalia Rudiak, whom I first met when I was working on Bill Peduto’s campaign in 2005. The transition teams for new mayor and the inauguration yesterday have left me thinking about civic engagement. I’m interested in how bloggers and social media can connect people to government and it all starts with voting. Rather than wait until the spring, take a moment to make sure your voter registration is up to date and to remind your friends to make sure they are registered to vote! You can fill out a voter registration form online and print it out and mail it in. There are two great websites that can help you with your voter registration. I just learned about this website a few weeks ago. 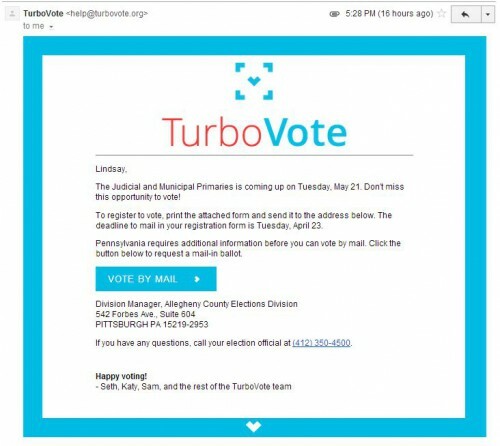 TurboVote is a super simple to use website – you put in your address and they will send you email reminders about voting deadlines. Attached to the email is a PDF of voter regsitration form that is already filled in with your information. All you need to do if open the PDF, print it out, sign it and mail it to the county board of elections. I have signed up for TurboVote and they do not send any extra emails. The image here is of the email I received last spring. Click here or the image below to access a out the voter registration form (via Rock The Vote website). Neither IheartPGH or Rock The Vote collects any of your information – we can only see how many people used the link to fill out a registration form.